NEW VINEYARD — Maine-made Easter eggs are on the roll from a local manufacturer to the lawn of the White House. 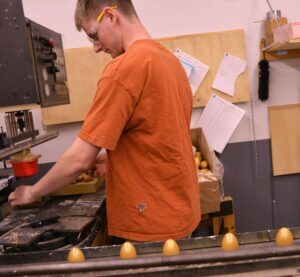 Maine Wood Concepts, located in Franklin County, is once again producing 110,000 wooden commemorative eggs for the White House Historical Association (WHHA). It is the official egg of the association and it is their fundraiser for public preservation and educational activities for the White House, said Michael Conway, director of sales and marketing at Maine Wood Concepts. The eggs are used in the annual Easter Egg Roll with some given to children who participate. The rest sell out pretty quickly, he said. The egg roll takes place on April 22 this year. The annual event was started in the 1870s. Over the years, wooden eggs replaced real eggs providing for less mess to clean up. “It is an honor to do,” said Jody Fletcher, who co-owns the expanded Maine company with his brothers, Doug and Gary. For a company with civic pride for employee participation in the local community, this is an opportunity to gain national pride, Conway said. It is too early to tell, but plans are underway for exposure of the local company on national television shows the week before Easter, he said. “We want to do it,” Conway said, of the limited order. The company has produced the eggs several times over the last couple decades through a bidding process held by other brokers and the Park Service. In recent years, the company has worked closely with the WHHA. They chose us and voice high praises for our work, he said. Conway acknowledges the artisan efforts of the crew at Fletcher’s Mill who turn 16-foot Maine logs into five different but highly-detailed collectible eggs. A golden egg highlights the Presidential Seal, with the White House adorning the other four colored eggs. Presidential signatures are on the back. “The First Lady chooses the colors,” Conway said of the eggs in gold, blue, green, pink and red. This year, the WHHA requested extra detail with sashes in the White House windows and it looks nice, Fletcher said. The government shut-down meant a loss of five weeks for the work, but the eggs will be done by Monday, April 1. White birch logs grown within miles of the mill are kiln-dried. Machine blades whittle the wood into the egg shape, then five layers of paint and a special coat are applied before each egg receives the printed image, Conway said. With 94 employees and applications being accepted, the mill considers their employee and forestry futures by working with Forest Stewardship Council (FSC) certified wood, he said. The company was started by the Fletchers’ father and uncle in 1971 and has expanded over the last 15 years. As Maine Wood Concepts, the company provides custom manufacturing of wooden components and products. It now includes other long-established companies purchased by the brothers, Fletcher said. Fletcher’s Mill produces a top line of quality gourmet cooking tools, game pieces and more. “The best American-made pepper mill on the market today is created at Fletcher’s Mill,” Conway said. But, it is all a team effort, Fletcher said of the work done by the second generation of ownership. The WHHA started selling the official 2019 White House Easter egg earlier in March. Conway said these can be found online – while supplies last – at https://shop.whitehousehistory.org/holidays/easter.